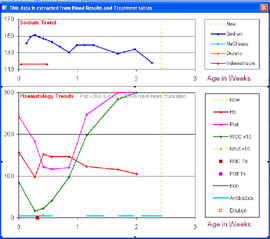 NICUS data (includes ANZNN data) has been collected in a purpose built database since the beginning of 2007. 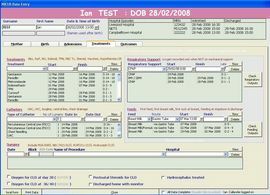 This follows an extensive review of data system requirements and methodology at the National Perinatal Data System Planning Workshop in 2004. 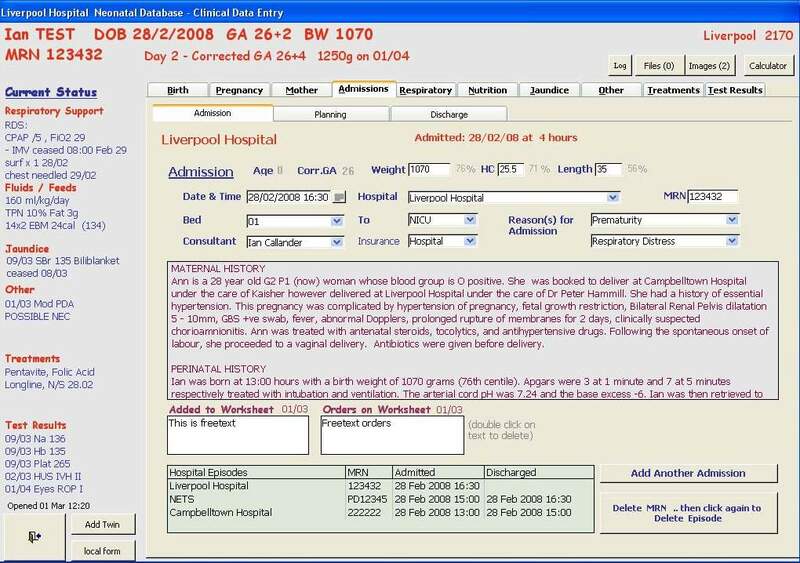 The new Neonatal Database has been constructed with minimal funding using MS SQL Data Server to house data, and MS Access as the user frontend. 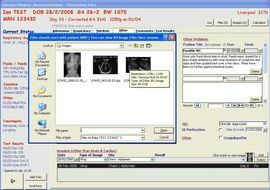 The system has been implemented in all 10 member tertiary hospitals with no significant cost required. 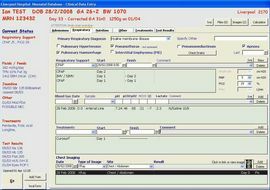 Data is entered as DateTimed records where possible, using the OHIO (Observational Historical Investigations Outcomes) Principle and Audit Outcomes are then derived. 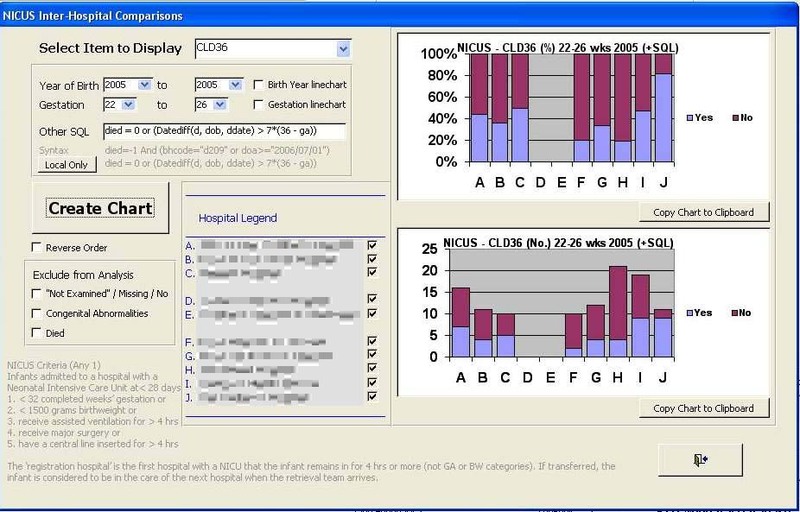 NICUS Data collected since 1992 is archived in the new database and is available for comparative analysis using either the built-in reporting module (graphical outputs included) or powerful adhoc pivot table analysis from MS Excel. 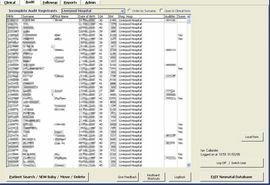 Data for other audits including ANZNN can be exported. The Clinical module of the Neonatal Database, is a quasi live data entry system designed to assist in day to day clinical management as well as generate discharge summaries. 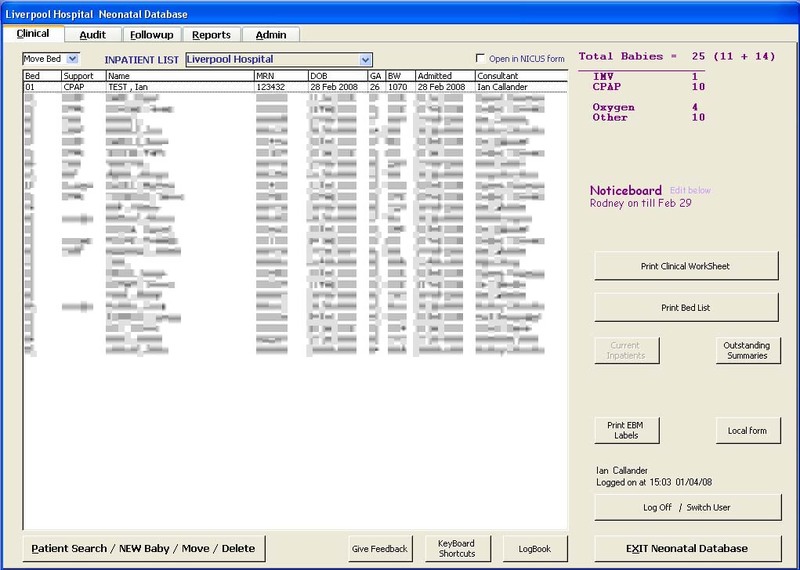 Initially implemented at Liverpool Hospital, this module is being progressively taken up by other units and has the functionality to manage patients as they move between hospitals. 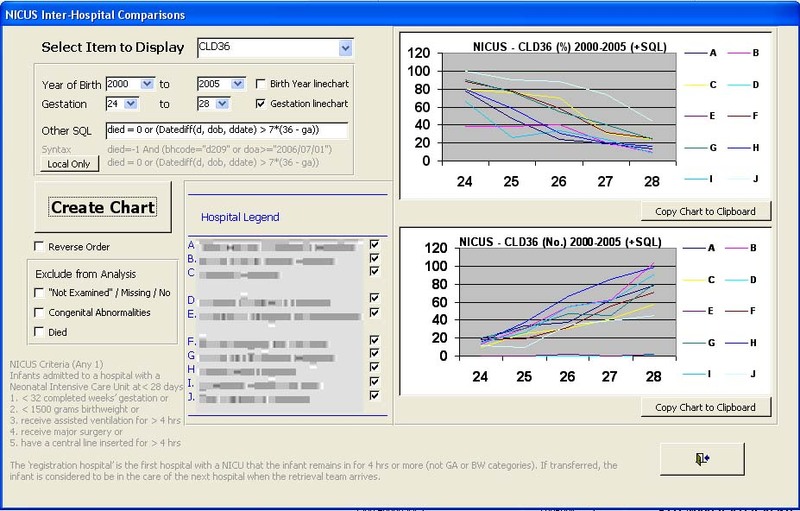 The NICUS Audit Officers have the ability to see auditable clinical data, correct it and lock it after discharge. 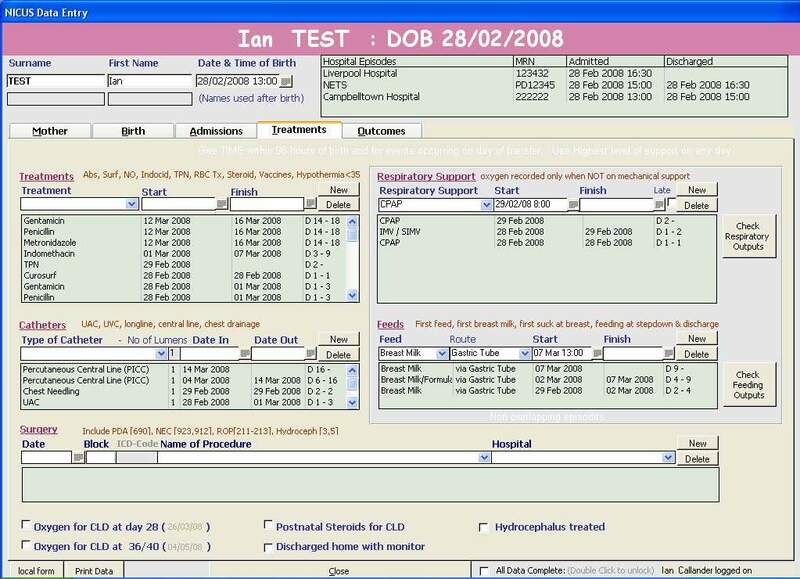 The Neonatal Database is available for ANZNN member hospitals free of charge, however a strong case can be made for the formation of a consortium allowing for improved development. 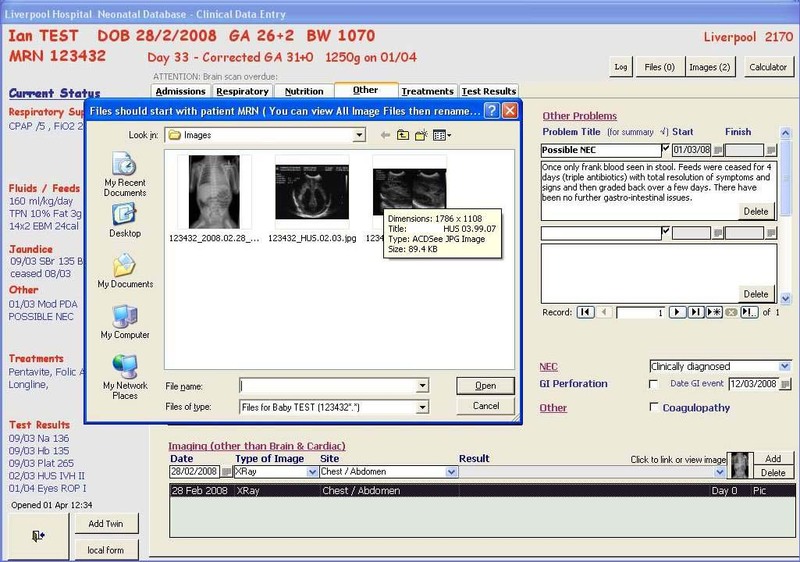 The open source model allows maximum flexibility and adaptability, but requires local IT support to implement. 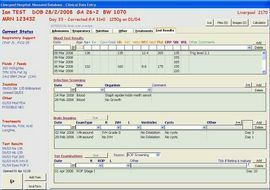 More recently a handover module has been created specifically for nursing handover and moves quickly from patient to patient with extra tools for planning and tasking. 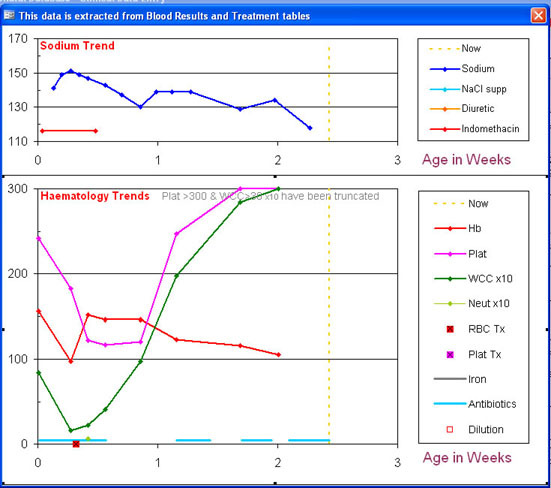 Current treatments, results and active problems down left side (calculated from data on the fly). 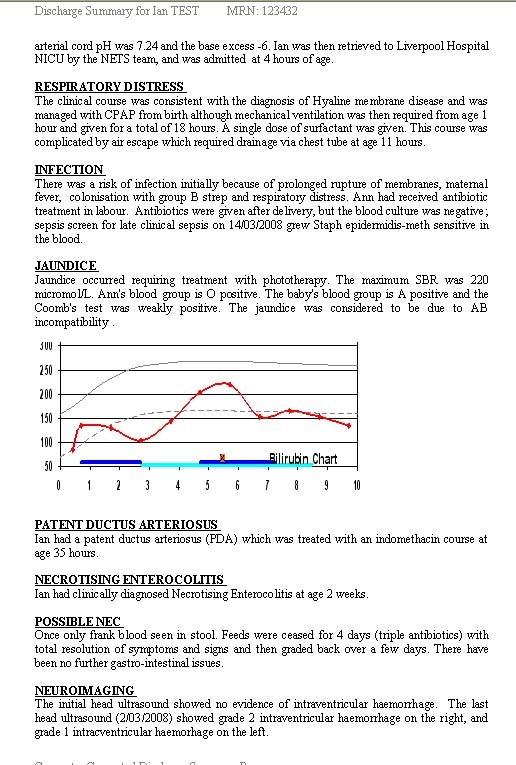 The Jaundice Tab is hidden after 10 days (made visible by clicking on Jaundice info on left side. 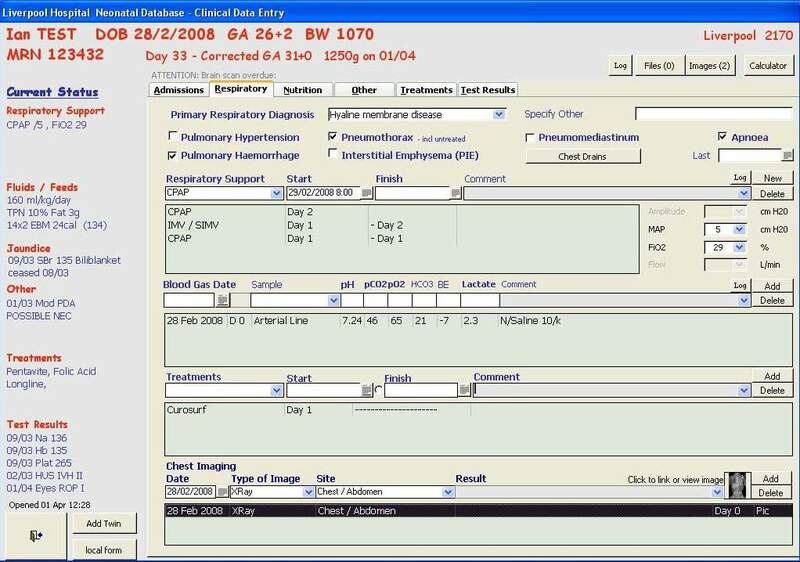 Patient Data Screen looks like this after 10 days. 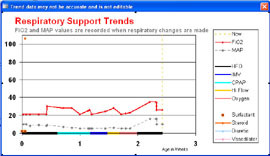 As the FiO2 and MAP/CPAP/PEEP are being changed during daily activities these values are being recorded so that they can be reviewed graphically against respiratory support / treatments by clicking on the "Graph" button on the Respiratory tab. 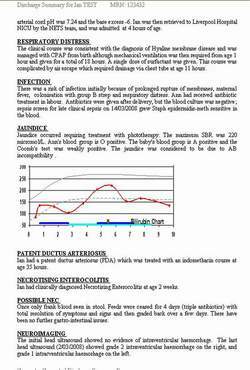 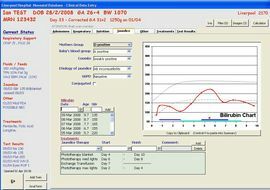 Temporal graphing of Bilirubin level versus treatment against customisable gestation dependant lines for phototherapy and exchange transfusion. 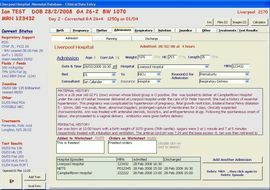 Other Tab - includes Cardiac (incl echo results), Neuro (incl EEG), NEC and Freetext problems. 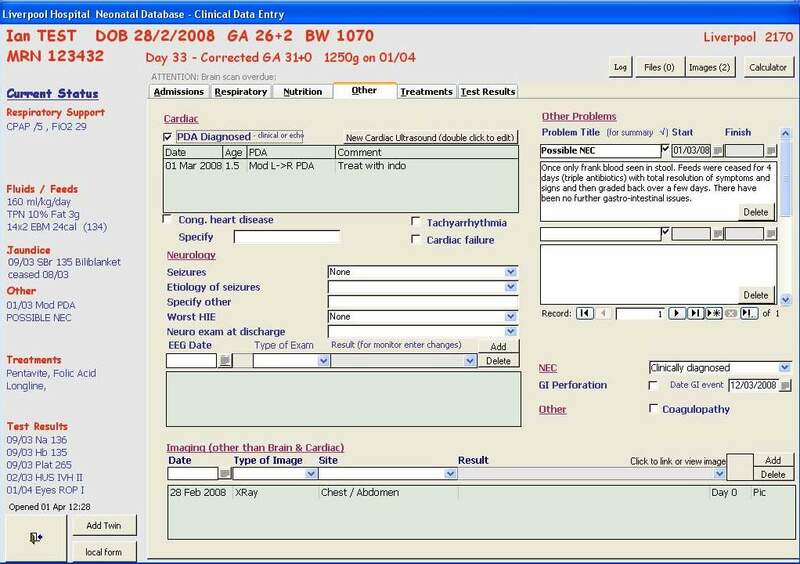 Problems entered as freetext are able to be datetimed to admissions, and will show on worksheets and in the discharge summary. 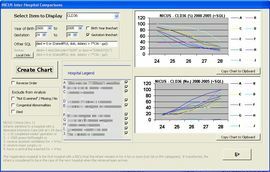 The Na+, Hb, WCC (Neut), Plat results can be reviewed graphically against relevant treatments by clicking on the "Graph" button on the Test Results tab. 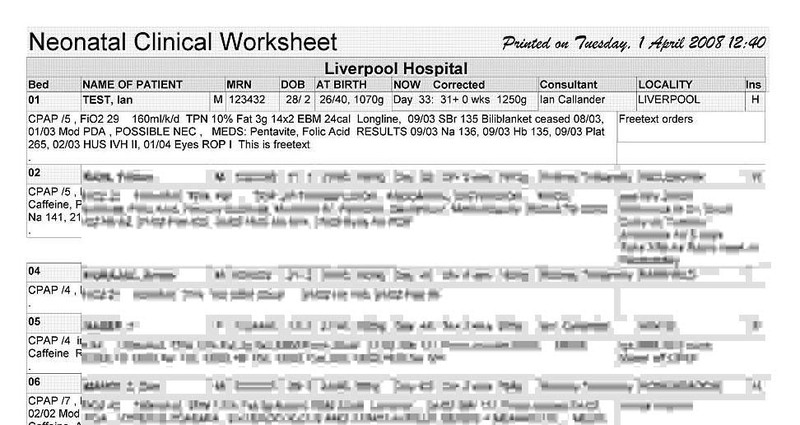 generated from the data plus freetext other problems. 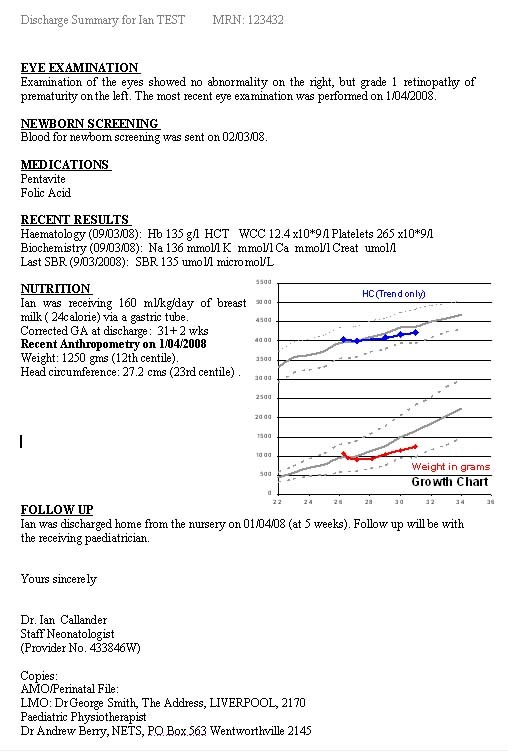 Created in MS Word with option for using own hospital letterhead. 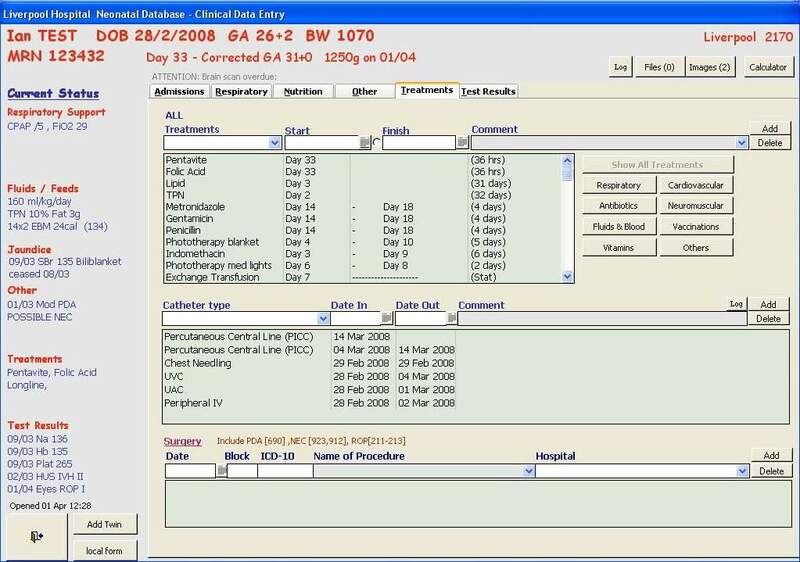 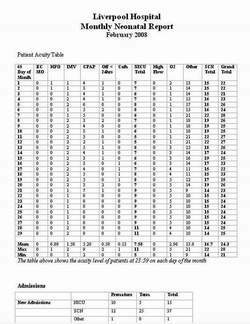 The mode of data entry is very similar to the clinical module, but is cut down in quantity. 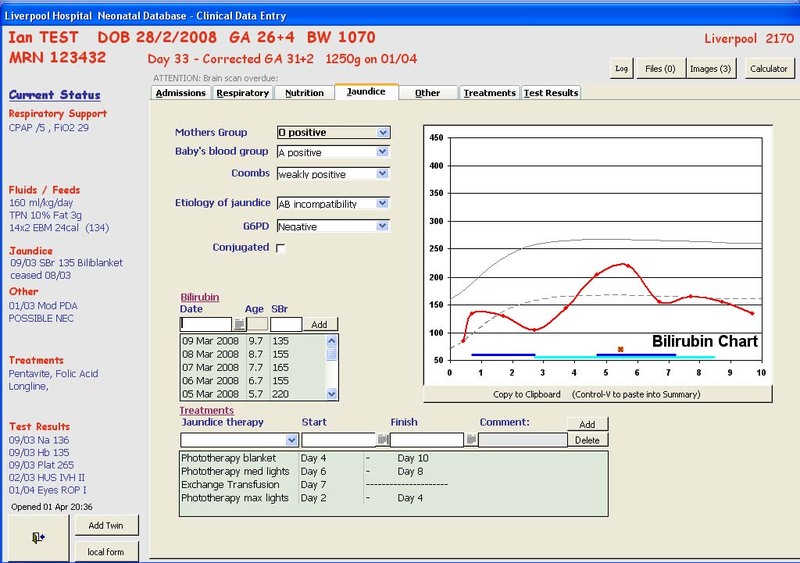 Respiratory and Feeding outputs are able to be seen before final closure and locking of the baby record with the generation of a new record in the audit table (calculated summary data outputs). 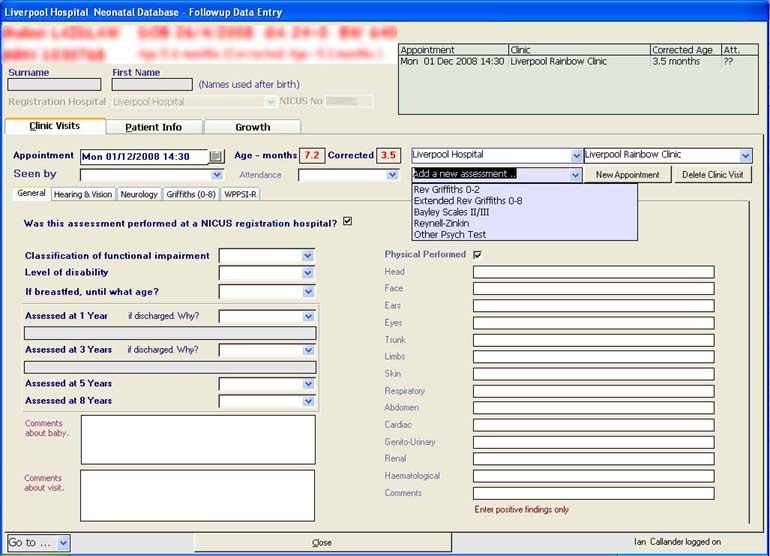 The Followup module has been created specifically for the follow-up of premature infants according the the requirements of NICUS NSW. 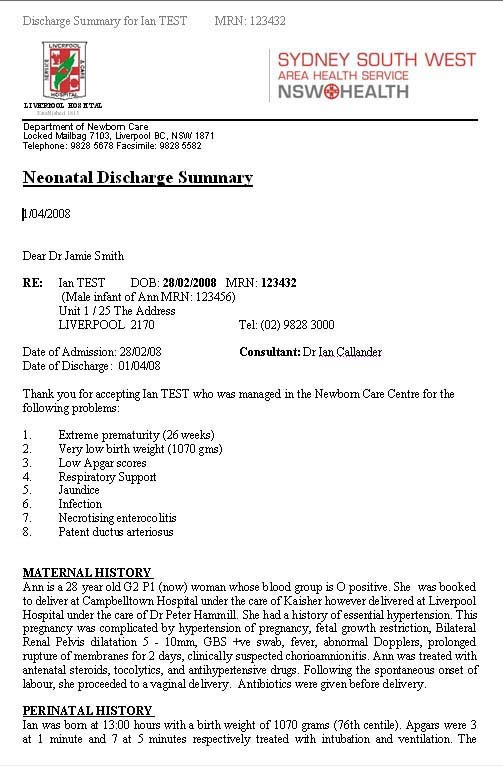 The list shows clinic appointments in chronological order. 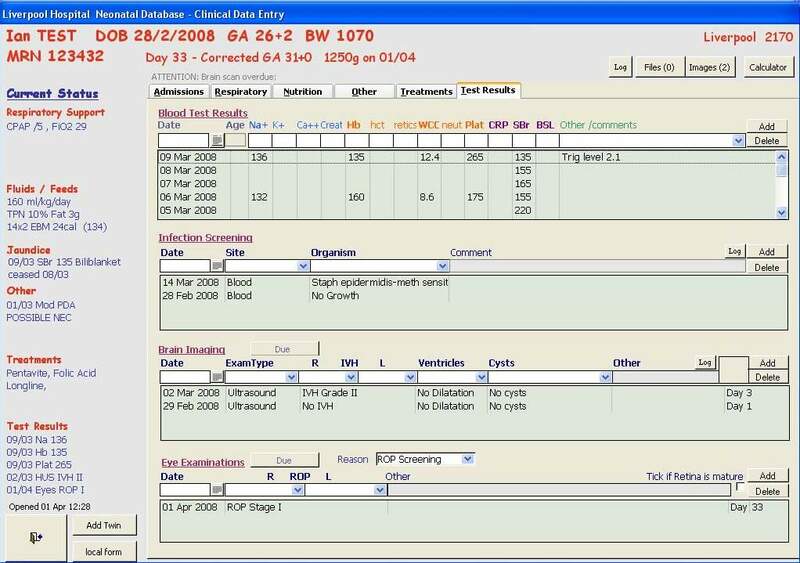 Assessments of Growth and Development are recorded here to enable the association of outcome data with inpatient data. 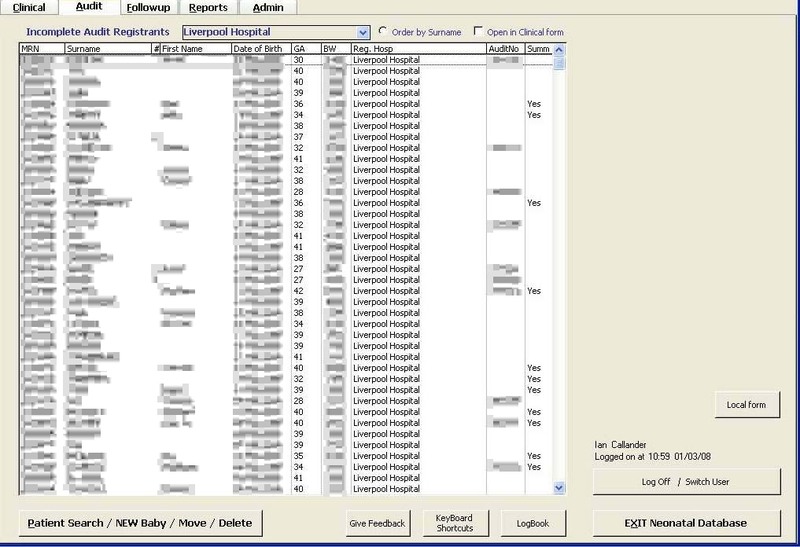 As this database is capable of having data from multiple institutions (linked live OR imported) there needs to be thought about who should be able to see data from outside the users intitution. 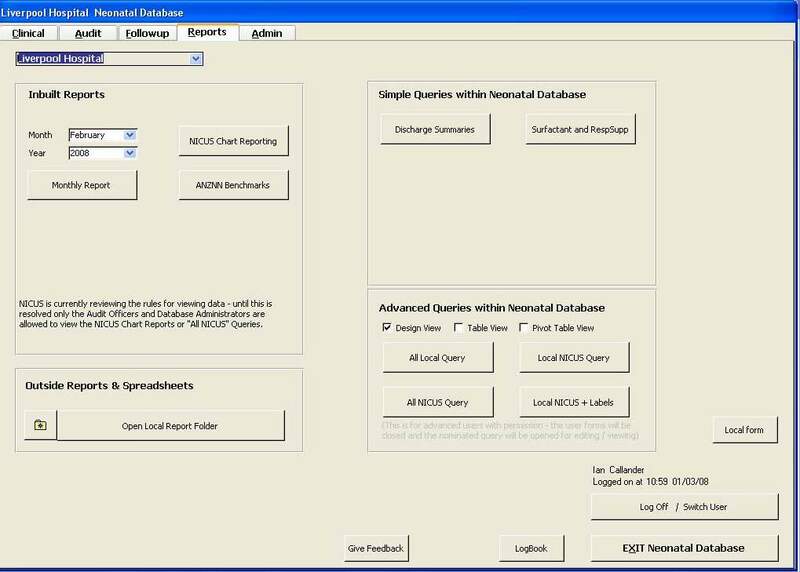 SQL server has security capabilities that make this very straight forward. 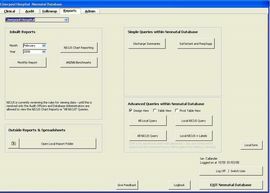 Outputs can be separated as local or pooled with other institutions. 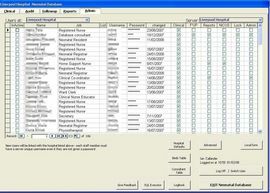 It is also very easy to have and Excel spreadsheet that is dynamincally linked to a query within the database that allows specific reports to certain users. 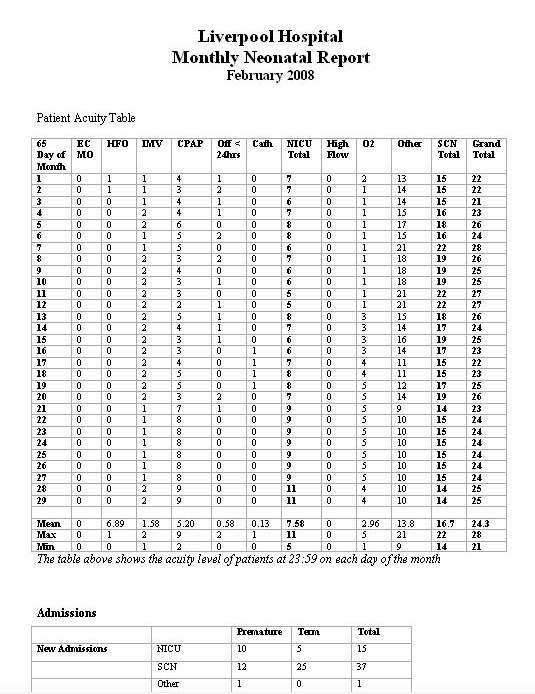 Monthly Unit Report with calculated occupancy broken down by level of care. 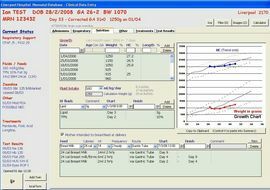 This interface is extremely powerful and enables complicated analysis from within the module. 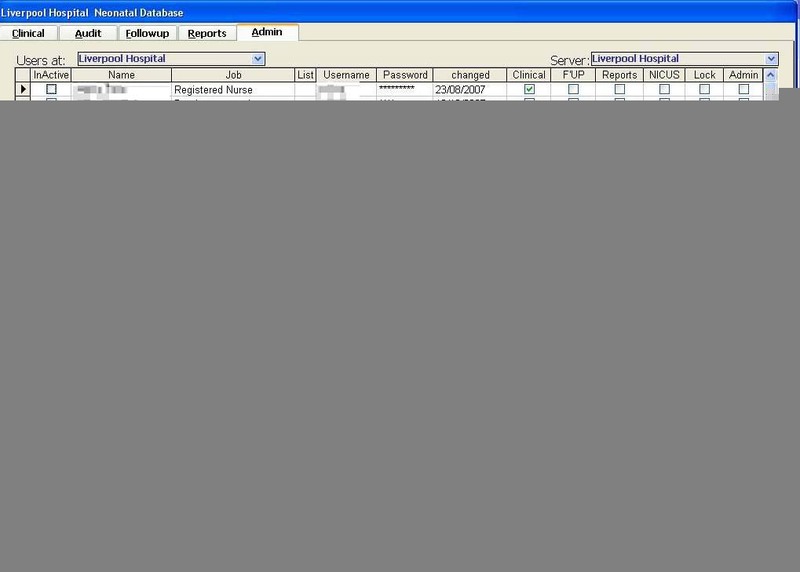 Of course adhoc reporting is still possible using a query analyser tool. 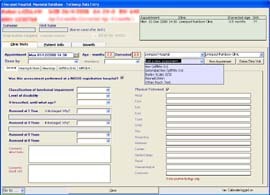 Update user access, hospital defaults, change lookup tables, enter SQL code (able to make backend structural changes from here) plus access to the actual tables, forms and code (if permission allows). 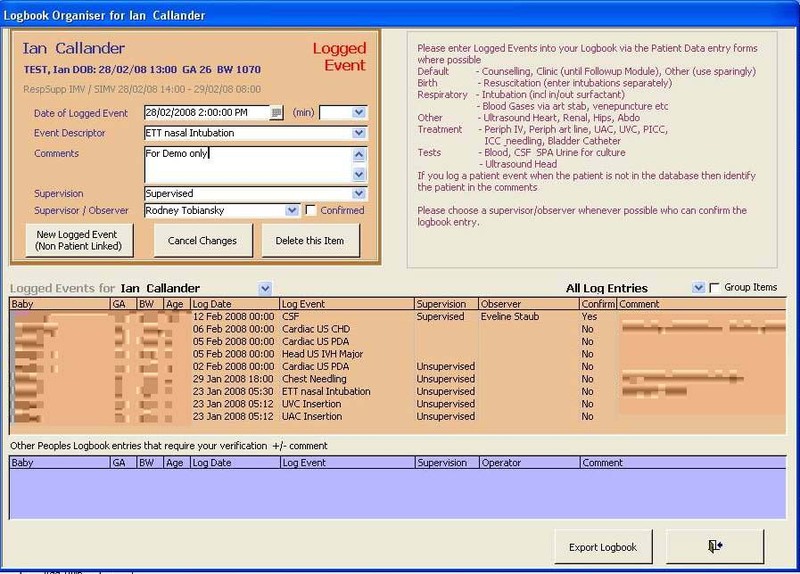 This is currently set up for medical staff to log procedures, counselling and education sessions (linked to the actual procedure within the database wherever possible). 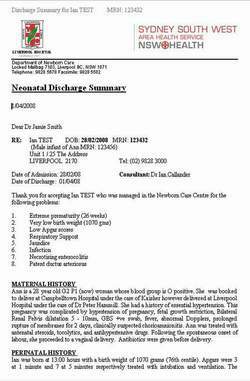 There is no reason this could be broadened to non-medical staff. 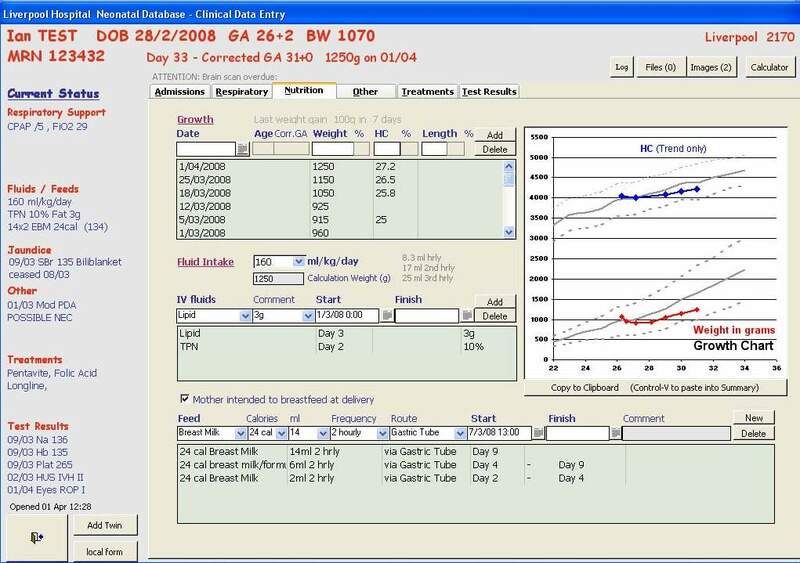 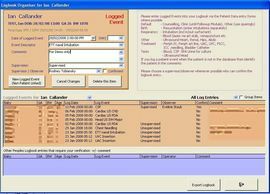 The logbook can be exported to an excel spreadsheet for transportability. 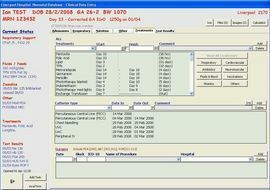 It is easy to connect to the data (with permission) from outside the database. 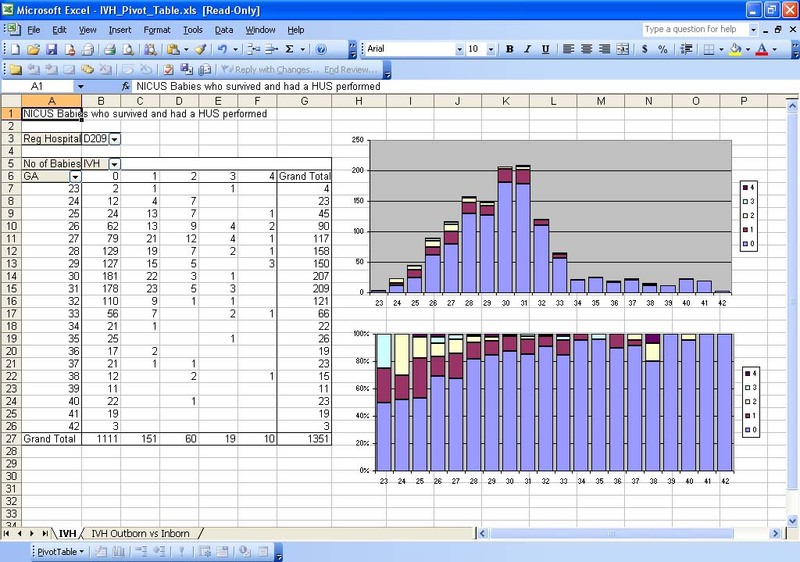 Shown here is an Excel spreadsheet that displays a PivotTable and Chart. 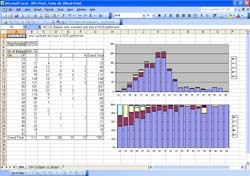 The chart can be sent as it is to anyone however if the spreadsheet can connect to the SQL Server (with permission) then the data can be refreshed and the table manipulated; then if you double click on a grouping the individual babies can be displayed (you have to see it live to believe it). 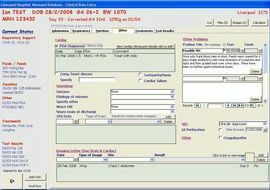 The Followup module and Family Support module have been implemented for specialised purposes and can be used as a template for those who would like to create an add-on module for themselves. 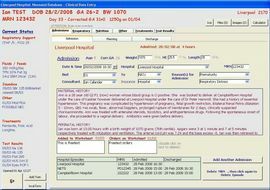 Each hospital can configure which assessment tools will be administered at their institution and make them available. 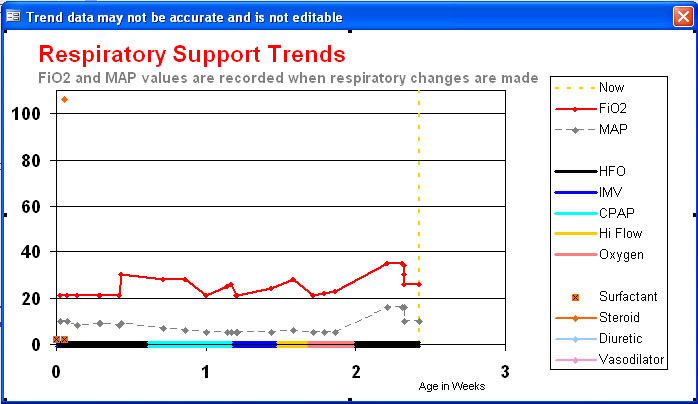 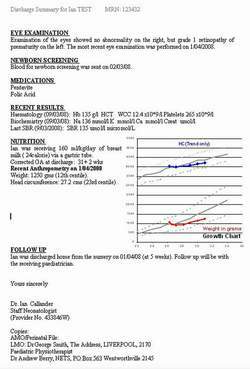 The growth measures continue from the inpatient period and are graphed with centile charts against corrected age.